CaSO4 . H2O; Hardness 1.5-2; Cleavage perfect one direction, distinct in other two (when visible); white, colorless, gray, yellow, red, brown; Luster pearly on cleavages. 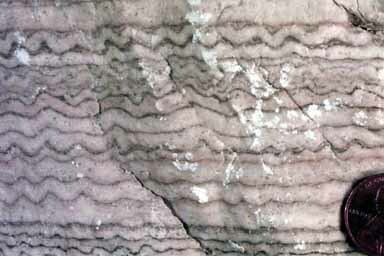 Laminated alabaster gypsum. Gypsum takes on many forms, such as alabaster, selenite, satin spar, and rose gypsum.